The recommended depth limit for recreational divers — even those with considerable experience — is 100 feet. Unfortunately, most of diving’s most dramatic walls and many of its best wrecks lie in depths approaching 130 feet. Once divers pass the 100-foot mark, potential problems such as narcosis, accelerated gas consumption and rapidly diminishing no-stop time increase exponentially. To better help divers deal with these challenges, Just Add Water offers the Deep Diver Specialty course. 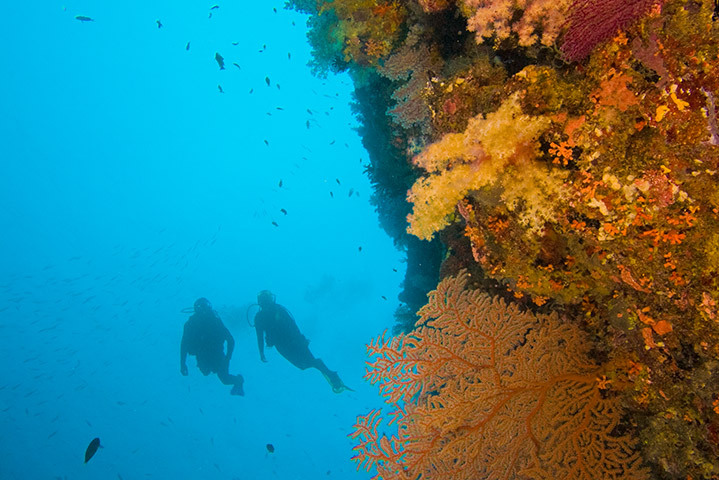 This course involves self study, followed by a single classroom session, during which you will go over equipment and discuss upcoming dives and skills. This is followed by open-water training dives. Except as noted, classroom sessions take place either at our Willoughby or Fairview Park locations. Locally conducted open-water training dives generally take place at Gilboa Quarry or on one of our Group Dive Trips. Contact Just Add Water for upcoming course dates. Please Note:While we make every effort to ensure that the information appearing on our website is accurate and up-to-date, it is your responsibility to call Just Add Water at least 24 hours in advance to confirm date, time and meeting place. Just Add Water reserves the right to cancel up to 48 hours in advance, due to low registrations, weather related concerns, or other unforeseen circumstances. In the event that Just Add Water makes a cancellation we will make every effort to find a suitable option for rescheduling. Just Add Water is not responsible for any monetary loss related to travel expenses including but not limited to, hotel accommodations, rental vehicles, etc. Proper equipment is essential for your safety & comfort while scuba diving. While we do have an extensive rental department please be aware that the safest and most comfortable way to dive is in your own total diving system. If you do not already own these items, please stop by Just Add Water to be educated on the different styles and what will work best for your diving habits. Being professionally fitted, (especially for your scuba mask) is essential. Your comfort and safety are of upmost importance to us at Just Add Water. We will do everything we can to make sure you are comfortable in your gear and enjoying your scuba experiences to the fullest. If you have questions about specific equipment requirements for this course, please contact Just Add Water.